Five-hundred feet up a slick rock face with a storm moving in and I was about to die…. At least that’s how it seemed as I clung desperately to the blank slab of granite, legs gyrating in fear, with crackles of thunder drawing closer. I’d forgotten how fast blue skies could turn to slate-gray in Rocky Mountain National Park in July above treeline. But frightening as it was being exposed to lightning, the impending storm was the last thing on my mind. I needed focus. 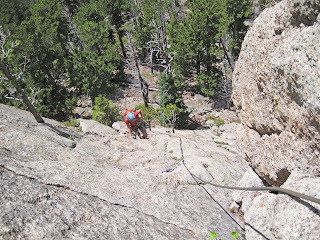 Somewhere on the supposedly easy three-pitch 5.5 rock climb on McGregor Mountain, my wife, Ella, and I had gotten lost. Off-route and fifty feet above the last marginal piece of protection that might arrest a potential fall, I was stuck. Best case scenario a drop now would entail one-hundred feet of sliding, scraping and tumbling down the mountain. With plenty of ledges and sporadic trees to smash into, the consequences of such a fall were too terrible to imagination. The less I tried to think about them, however, the more readily the images come to mind: broken limbs, snapped vertebrae. I doubt even my helmet would do much good. Above, the rock steepened. The terrain was closer to 5.9 than 5.5 and slippery with the loam of disuse. Great cracks where I could install gear to catch a fall were tantalizingly close on both sides, but getting to them looked nearly impossible. How could this have happened? The whole situation, the very real possibility of disaster on what should have been a fun, mild afternoon outing, was starting to seem surreal, like one of those bad dreams from which you shake yourself awake and laugh. Panic nearly choked me. With Ella somewhere out of sight far below me and well beyond earshot, I was quite alone. How much longer could my quaking legs hold on before they shook me off the rock and sent me caroming down to face my doom? Climbing any direction was dangerous, but I could only hold on for so long. That one-hundred-foot tumbling whipper was drawing closer. An ill-timed crack of thunder, the closest yet, echoed off the tall, rugged peaks. The storm would soon be upon us. In 2012 the Rocky Mountain Rescue Group, an organization of all-volunteer responders who specialize in rescues on mountainous terrain in Boulder County, published a report with analysis of all incidents in Boulder County involving rock climbing and hiking over a 14-year period. 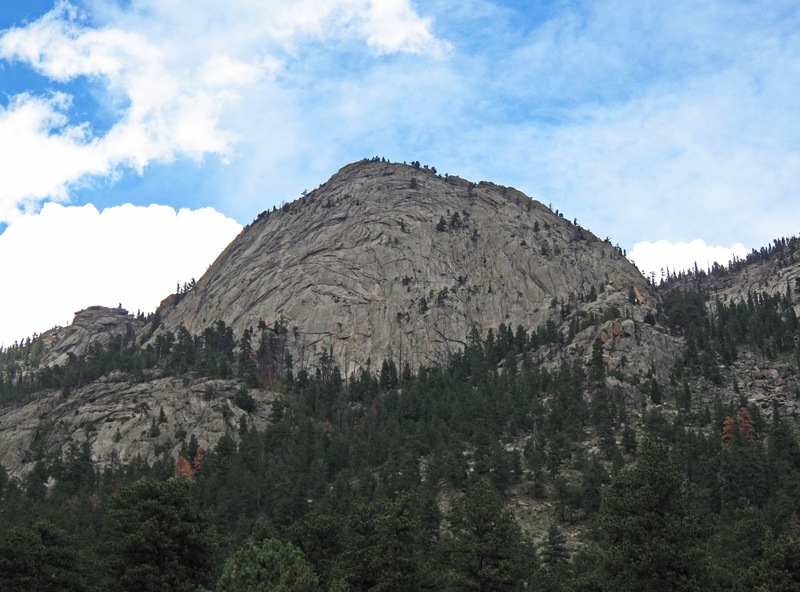 Although RMRG does not cover Rocky Mountain National Park, the group services nearby Boulder Canon, Eldorado Canyon and the Flatirons, some of the most popular climbing areas in the state. This large sample size provides a unique cross section of climbing-related injuries and fatalities. Although the potential of falling while lead climbing is a predominant fear in the mind of most rock climbers, as it turns out it is not nearly the most common cause of injury or death. While RMRG was called to assist 428 rock climbing accidents in this period, only 5 were fatal incidents involving roped lead climbing. A much higher ratio (12%) were involved in belayer-error incidents and an even higher number (as much as 45%) involved rappelling and/or getting lost on the descent. Although the inglorious “whipper,” as a roped lead fall is often called, tends to dominate the Youtube videos and rock climbing tales of woe, it seems the things often taken for granted (i.e. 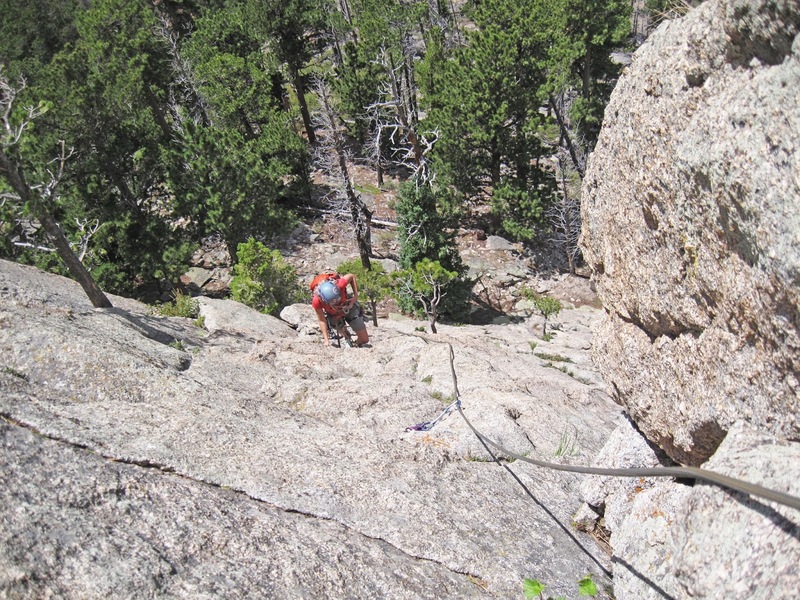 your belay partner or your ability to get safely off the mountain) more often than not prove to be more treacherous. Knowing the relative safety of lead climbing, however, does little to calm quaking nerves when faced with the possibility of a dangerous fall on a difficult rock climb. Time was up. I could delay no longer. Action had to be taken before I simply peeled off the mountain in exhaustion. I was tempted again by the safe crack system some twenty feet to my left. Getting there, however, involved crossing a strip of impossibly blank rock, no hand or foot holds in sight. A ridiculous part of my mind considered just lunging for it. Going right looked steeper and even more dangerous. Downclimbing was an option, but leading with your feet was always considerably more difficult than with your hands, so I quickly ruled it out. The only real choice that remained was to go up. Although every bit I climbed would increase the length and danger of a fall, it seemed that in order to find safety I would have to swim through the belly of the beast. The smooth shield of granite above was broken only by a thin seam. Though it was not deep enough to sink in spring-loaded cams capable of catching a fall, it provided just enough texture for my fingers and toes to scale upward. I pulled higher and higher, increasing the fall potential with every move. I climbed ten feet. Twenty feet. I was so far above my protection now it was almost comical. My life depended on the grip of my fingers, and the friction between my rubber shoes on the slick granite. The slightest slip or broken rock and my worst nightmare would rush upward to meet me. Would it hurt to take a fall like that? Or would it happen so fast the lights would simply go out in a blink? I was eighty feet above my last cam. Then one-hundred. It had to end eventually. This rock couldn’t go on forever. Then abruptly, almost magically, a crack appeared in front of my eyes. I was so focused I nearly climbed past it. Shocked I had made it, I plugged in a cam and clipped in my rope with disbelief. I was safe. I installed a second cam just to be sure. The earthquake in my legs slowed. I wasn’t going to die today. Not long after, the angle of the wall flattened and I found myself standing on the top. The storm I had thought was building had swung far to the north. I constructed an anchor and began to belay Ella up to join me. Already my fear from just a few minutes before was beginning to fade. Surely, I had not been in nearly as much danger as I’d thought. Here I was, not injured or lost or stranded. In every sense of the word the climb was a complete success. I stood atop a mountain with a sea of beautiful ridges and notched spines all around. Blue sky broke through the clouds. If you enjoyed this post, consider signing up for my mailing list. When not recollecting near-death mountaineering experiences, I blog about all sorts of bizarre, educational, entertaining, and occasionally funny topics from what makes an effective first paragraph to giant redwoods, medieval sailboats, the ancient Mayans and more. If you do sign up, you will get a once-a-week update on my posts and NOTHING ELSE! No spam, no selling your email to third parties. Okay, if I ever get around to publishing one of these works in progress that are constantly haunting me, I might send out an email letting you know. In the meantime thanks for reading!